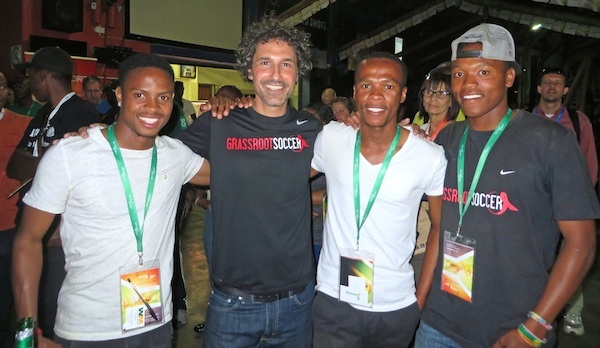 Grassroot Soccer (GRS) has been deeply engaged this week in the 2014 Beyond Sport Summit, taking place in Johannesburg, South Africa. The Summit brings together the most influential and pioneering leaders from the world of sport, business and community development to explore the potential of young people and future leaders in driving social impact and becoming positive change makers. GRS is partnering with Beyond Sport to inspire attendees through programs, activity sessions, panel discussions, and more. 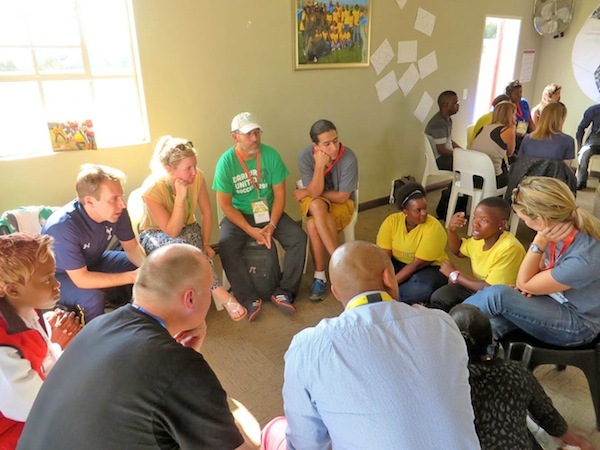 Beyond Sport delegates participate in small group discussions, led by GRS staff and coaches in Alexandra, around addressing problems facing youth. James Donald, GRS South Africa Managing Director, moderated the Beyond Health panel hosted by Nestlé. 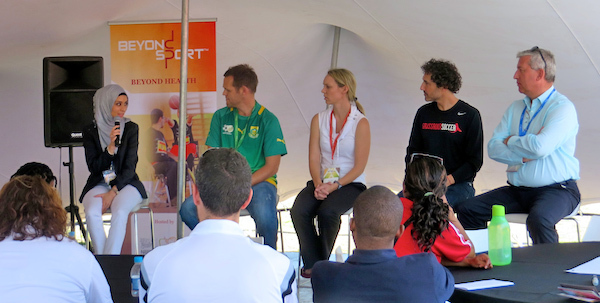 Ethan Zohn, GRS Co-founder, contributed to (1) an Expert Talk Panel on youth inspiring innovation, leadership and sustainable impact and (2) a health session on global health issues and the role of sport in addressing them. Sikhumbuzo Mnculwane, GRS Site Coordinator, facilitated a roundtable workshop on developing partnerships for HIV testing and treatment. GRS South Africa Managing Director James Donald (in green) and GRS Co-founder Ethan Zohn (in black) take part in the Beyond Health panel. GRS hosted an open site visit at the Alexandra Football for Hope Centre for Beyond Sport delegates to learn about and experience Grassroot Soccer’s innovative programming. GRS led an interactive on-pitch session showcasing a Barclays-funded program building employability skills in young community members. 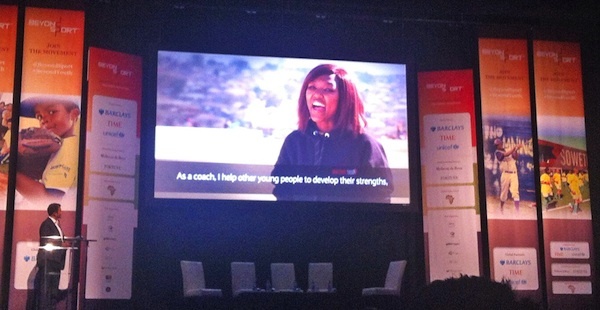 A video highlighting the GRS Coach Development program, supported by Barclays and Absa, is presented at the Summit. GRS Coaches represent 3 of the 8 Youth Ambassadors for the summit. They are: Bongani Sibaya, Sphesihle Buthulezi, and Bongani Sibisi. Over 50 GRS Coaches and team members participated in the Beyond Sport Summit. 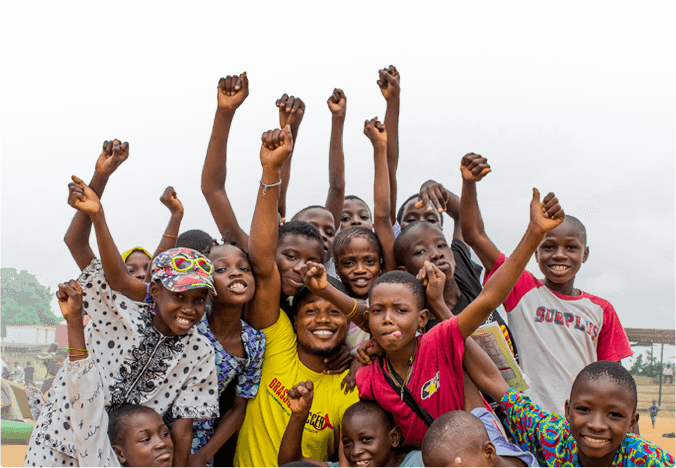 Beyond Sport is a global organisation that promotes, develops and funds the use of sport to create positive social change across the world. Visit www.beyondsport.org for more information.